Little Feathered Buddies • View topic - How to teach play dead trick? How to teach play dead trick? Post subject: How to teach play dead trick? I’ve really been wanting to teach the play dead trick to Kermit, where you point your finger and say “bang” and the bird falls over on its back. I know many conures lie on their backs naturally during play, but Kermit doesn’t do this. He does the bat trick where he hangs upside down from my finger on command, but he isn’t willing to do it on a flat surface. I tried getting him to put his foot on my finger and then tilting him sideways, but he lets go as soon as I start to tip my hand. How do I teach him the trick without potentially losing his trust? I think it looks really cool and I’ve been wanting to teach it to him for a long time. Post subject: Re: How to teach play dead trick? Does he ever lay on his back of his own free will? If he does, then as a first step you can reward him with a treat whenever you see him doing it. Then you need to gradually work toward getting him to do it when you give the signal. If he doesn't do it on his own, you'll have to work toward getting him to let you roll him over as the first step, which will be harder to do. At first you would reward him for letting you tilt him just a little bit, then gradually work on tilting him further and further before he gets the reward. Positive reinforcement training aka clicker training is the way to teach birds tricks like this. It's more complicated than it looks, and it doesn't come naturally to me. I have a very basic article about it here: http://www.littlefeatheredbuddies.com/i ... icker.html but you'll get a lot more guidance from other resources. My information on this is pretty old and I'm not well informed on where the best groups for this are currently. But if you look around you'll probably find an active bird training group. I’ve never seen Kermit lay on his back on his own before. I know many conures do it, but Kermit isn’t one of them. 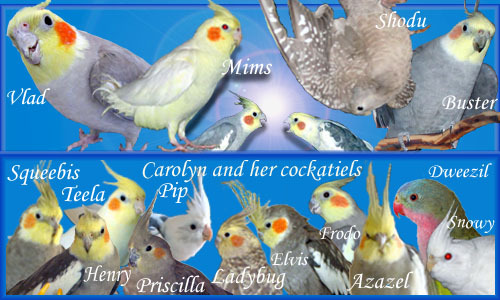 I don’t use a clicker to train my birds. I’ve had great success teaching Kermit and Ducky lots of other tricks, but I think the play dead looks the coolest. It’s also the one I haven’t been able to teach. Kermit doesn’t let me tilt him even a little bit - he just lets go of my hand before I get the chance. I guess it’s okay if he doesn’t do this particular trick, but I’m not sure what else to teach him. He already knows a lot: he can do wave, spin, wings, flip, bat, come, and tunnel. Ducky can do wave, spin, wings, tunnel, come, fetch, basketball, and ring toss. I’m running out of ideas for new tricks. You can do positive reinforcement without actually using a clicker. I find that it's easier without the clicker since there's one less thing to hold onto. If he doesn't lay down on his own and won't let you tilt him, you could try holding him in your hand and turn him on his back for a second without giving him any choice in the matter, then reward him generously. It's a total violation of all the rules of clicker training lol, and if it upsets him then stop doing it. But if he's more or less OK with it then it might be a way to get him used to it. You could start out by rewarding him just for letting you put your hand around him, then tilt the hand a little more each time.